Tampa Divorce Attorney For Men - Divorce Lawyer For Men Tampa FL | In Law We Trust, P.A. Florida statutes refer to divorce as “marriage dissolution.” Divorce not only ends a marriage, but in many ways, changes the lifestyles that went with it. Divorce and family law addresses the dynamics of family relationships from a legal perspective, and sets the parameters for parenting, custody, financial support, rights against domestic violence, and other family matters based on Florida law. The firm of In Law We Trust, P.A., has developed a prominent presence in the Tampa, Florida area for our expertise in the practices of divorce and family law. 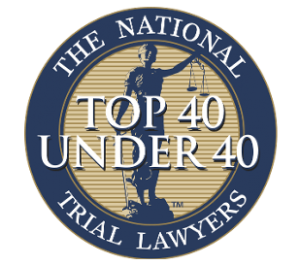 We are recognized for representing men during this difficult time and combine highly personalized, compassionate, and detailed representation with aggressive advocacy for each of our client’s rights. If you find yourself facing divorce or family law issues, it will be to your advantage to seek legal representation as soon as possible. By working closely with In Law We Trust, P.A., you may be able to preserve many assets, minimize tax consequences, and in some cases even keep the family home. Our attorneys have built our reputation on the fundamental recognition that divorce and family law issues are complex, they are emotionally and financially taxing, and can be overwhelming for all of the parties involved. We can guide you through this maze, provide valuable legal guidance and representation, and help you gain the stability and certainty you need to move forward with your life. Divorce and family law proceedings bring several legal issues into play, particularly when children are involved. One of the most difficult aspects is working out a parenting plan (visitation rights and custody) and arranging schedules in the children’s best interests, while also accommodating the demands on parents’ lives. Options for custody include sole custody, joint custody, and rotating custody. We help you develop a sensible, workable parenting plan aligned with the best interest of your children. Florida Child Support Guidelines dictate child support calculations. However, some couples have special situations that require a more customized approach. We work to see that child support payments are structured to make sure both parents pay their fair share of the financial responsibilities. In Law We Trust, P.A. helps clients obtain values for the assets accumulated during the marriage, including real estate, retirement funds, business interests, bank accounts, and prized possessions. We also help identify accrued debt and other obligations. Our firm’s specialized expertise in understanding Florida Law and Father’s Rights and will ensure that there is a thorough examination of all of the financial factors involved. Today, both spouses are often working, and not every divorce involves alimony. The crucial factors in awarding alimony are determining the extent of a spouse’s inability to be self-supportive, along with the lifestyle previously maintained during the marriage. In a household with only one spouse working, things can get complicated and emotional, but the Law Offices of In Law We Trust, P.A. know how to manage such issues and keep the emotion out of it. Domestic Violence is often either a cause or symptom of family issues and divorce. The main priority is ensuring safety for victims. That can be done through a protective order or restraining order, which Florida statutes refer to as an “injunction for protection.” Unfortunately, this is often a necessary step taken by family members who are fearful of their domestic situation. Whether you are the protected person, or the opposing party, be sure to seek legal counsel. Any criminal law allegations concerning yourself, your spouse and/or your children may bring about an investigation by a child protection investigator with the Florida Department of Children and Families. The Department may attempt to take the children out of your home unless or until the parent performs certain tasks such as frequent drug testing, weeks of parenting classes, or participation in family counseling. If you feel the original allegations are false, you need an aggressive defense attorney to fight for your and your family’s rights. The Law offices of In Law We trust, P.A. will listen to you with an open mind and discuss how to deal with these circumstances. Our goal for you is fair financial obligations with meaningful time sharing. If you are without children, we will work very hard to protect the financial status you have worked so hard to obtain. At In Law We Trust, P.A. we understand the unique needs of men in divorce and related legal proceedings – we have dedicated our practice to men’s rights. We will work to protect your financial interests in divorce, such as setting reasonable and fair child support and/or alimony support, and make sure you retain your parental rights in child custody and visitation litigation. Whether you are getting divorced or separated, with or without children, it is important to work with an attorney who understands your unique situation, and who is willing to fight for your rights as a man in Florida courts. Our firm represents fathers in divorce, child custody, and related legal matters. If you wish to speak to a men’s divorce attorney in Tampa, FL, about your family law concerns, please contact us today. 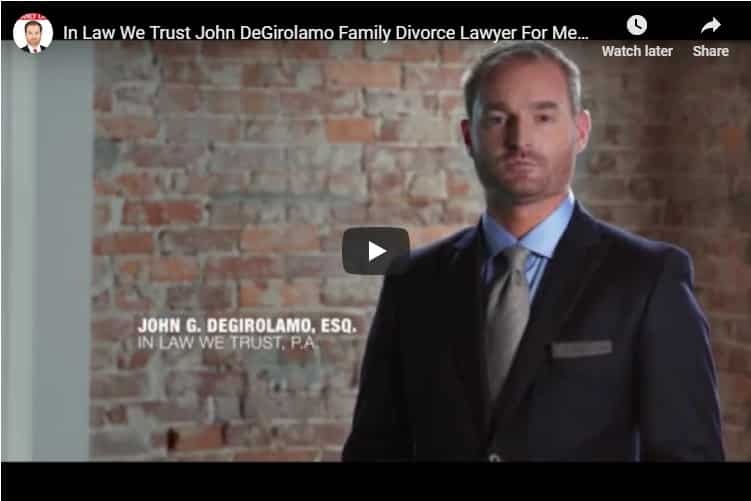 John DeGirolamo, Esq is a family and divorce lawyer for men.